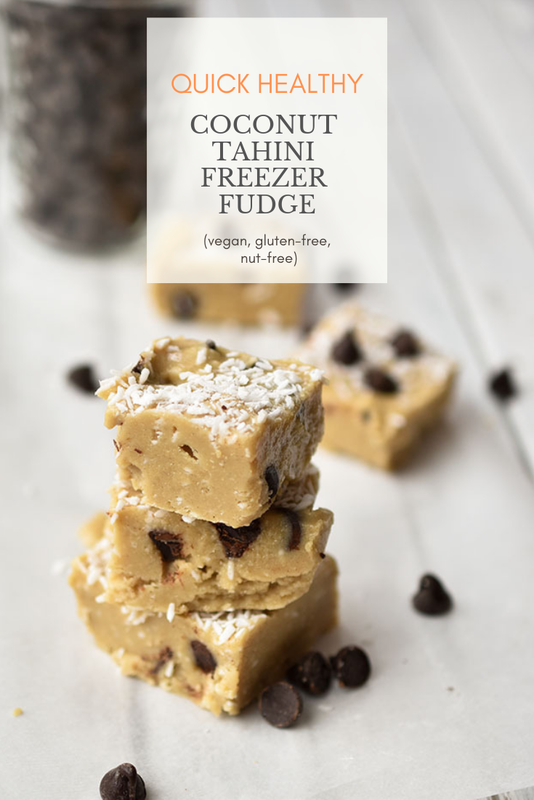 I know that the tahini freezer fudge trend has been going strong for a while now, but I nevertheless wanted to share my own variation of this delicious, addictive, healthy dessert recipe sensation. If you have not yet heard of tahini fudge, it might sound just a little bit odd. Tahini is for making hummus, right? Well yes it is. But it turns out you can also make some very nice fudge with it. Will it taste like tahini? Kind of. In a good way. Read on for the details. 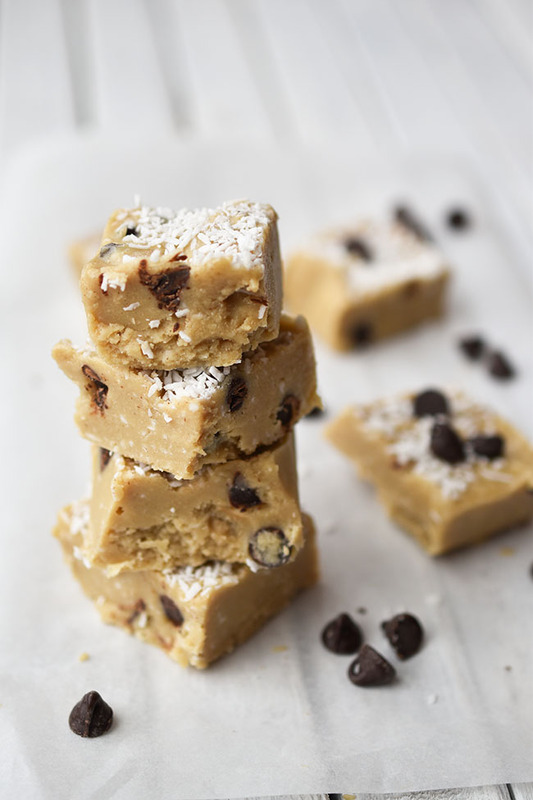 While tahini is slightly bitter, the effect is mitigated in this fudge with the help of some sweetening ingredients - brown rice syrup, shredded coconut and chocolate chips. It makes for a unique and tasty treat that balances bitter and sweet. It might not be for everybody - my teens for example. For youngsters, try adding more brown rice syrup or other sweetener. Drizzling chocolate on top couldn't hurt either, as long as it's not too warm. These fudge is very melty. Keep it in the freezer until you eat it. Tahini is made from ground sesame seeds, and offers up plenty of protein, plus beneficial vitamins and minerals such as B vitamins, vitamin E, magnesium, iron and calcium. 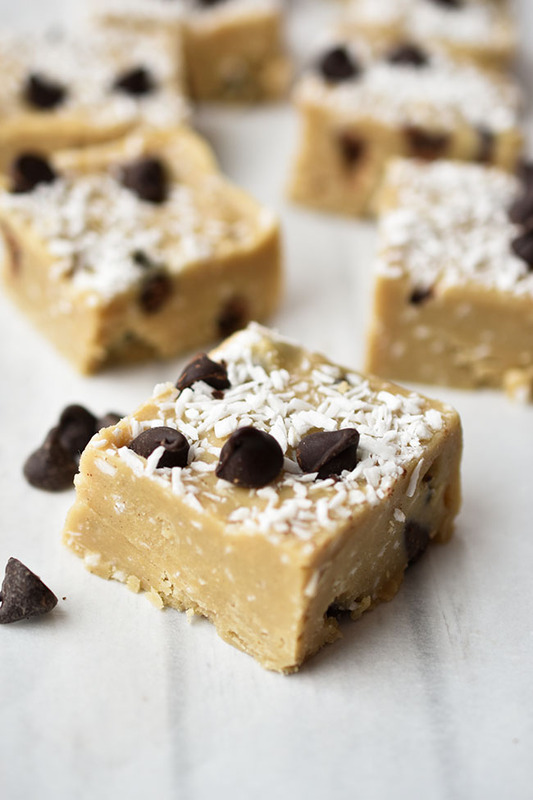 This fudge is so simple and quick to make - just stir together tahini, coconut oil, brown rice syrup, shredded coconut, chocolate chips, vanilla and salt. Transfer the mixture to a loaf pan lined with parchment paper, sprinkle on shredded coconut and chocolate chips and transfer to the freezer for about half an hour. Voila! 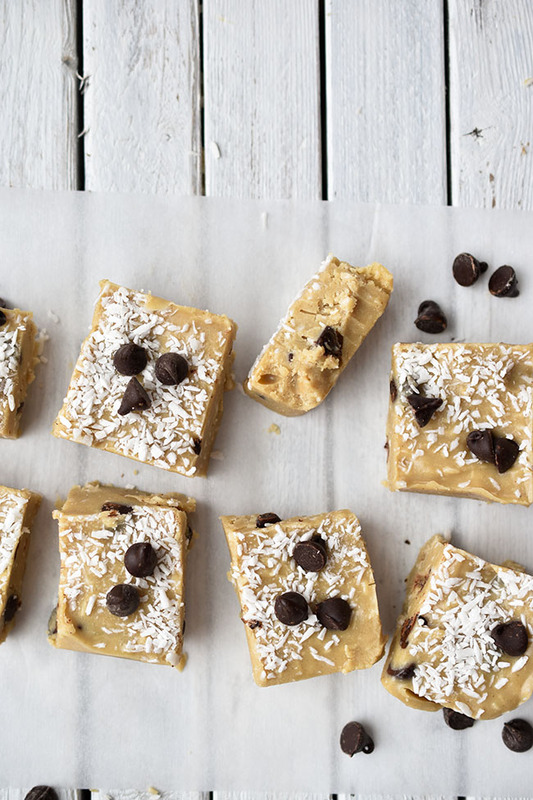 Your quick, healthy coconut tahini freezer fudge is ready to eat! 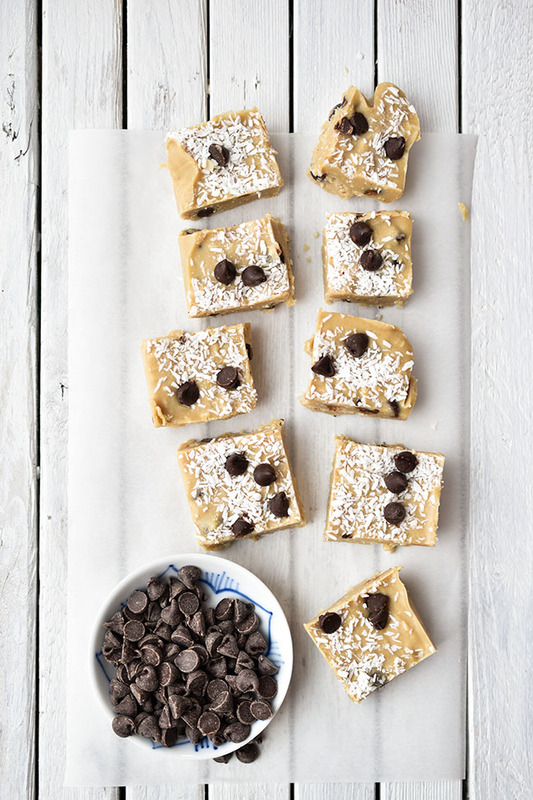 Not only is this tahini fudge recipe naturally vegan, it's also gluten-free (be sure to double check that the brands you use are gluten-free) and nut-free, as well as raw. 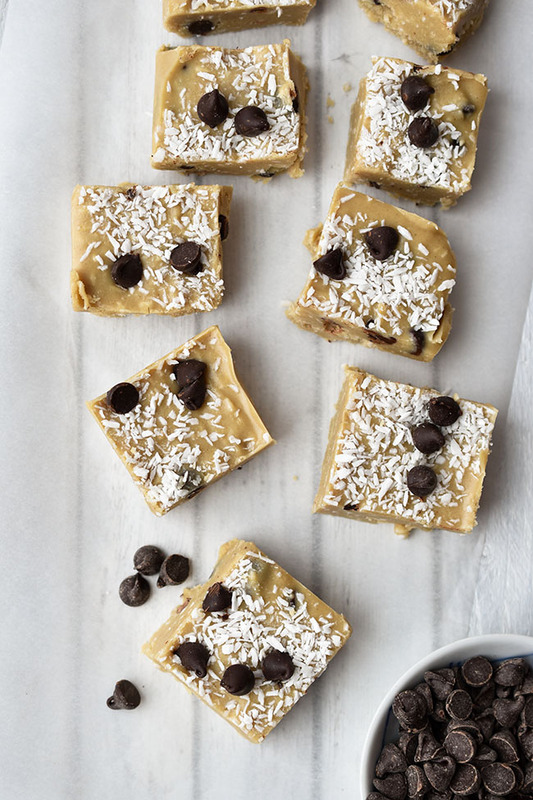 This tahini fudge has a pleasant crunch of coconut and chocolate chips inside of smooth, melt-in-your-mouth creamy fudge. It makes for a great snack or dessert and I would even say it could fill in for breakfast in a pinch. 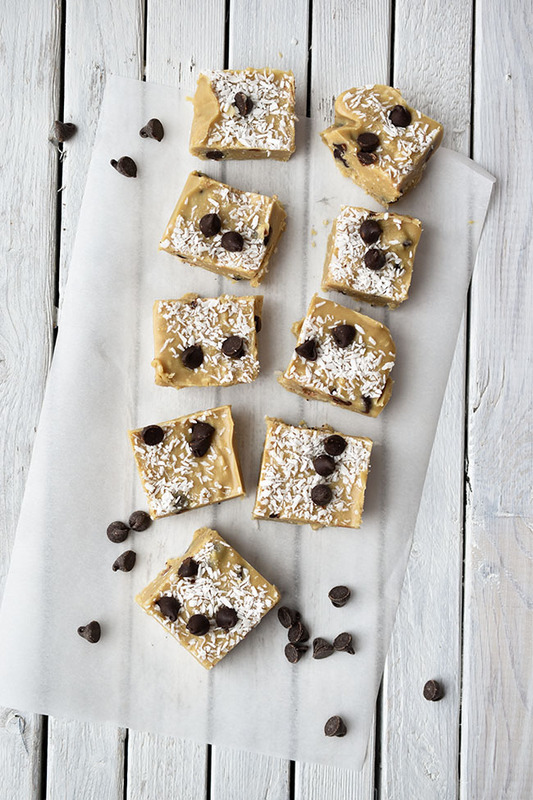 We keep tahini on hand at all times for making hummus, and the other ingredients in this fudge are also pantry staples, so it's easy to whip together this recipe at a moment's notice, without having to run out to the store for any fresh ingredients. Have you made fudge with tahini before? What flavour? If not, is this something you're interested in trying? What else do you make using tahini? To a large bowl, add tahini, coconut oil, brown rice syrup, vanilla and salt. Stir until smooth. Stir in 2 tablespoons of shredded coconut and all chocolate chips. Transfer mixture to loaf pan. Sprinkle remaining 1 tablespoon of coconut on top. Sprinkle on a small handful of chocolate chips (optional) and press slightly with your hands. Freeze until fudge is solid, about half an hour. Remove from pan by lifting parchment paper and cut fudge into small squares. Store fudge in the freezer.